One of the most critical aspects in the feasibility study of an on-shore / off-shore wind farm is the identification of the optimal site, through the preliminary analysis of the local wind regimes (wind reanalysis). Preciso® wind is a wind reanalysis service studied to identify and characterize the optimal sites for the installation of wind turbines, through wind modelling and reconstruction and without the need for long and expensive wind measurement campaigns. Preciso® wind uses for the reanalysis a meteorological model which employs large scale input data, coming from the ECMWF (European Centre for Medium-Range Weather Forecasts) reanalysis of the wind, temperature, humidity, ozone and surface pressure of the atmosphere, that are produced by a four-dimensional variational assimilation system, where a significant and increasing contribution is represented by EO data provided by polar-orbiting and geostationary satellites, like ESA Meteorological Missions, driven mainly by Weather forecasting and Climate monitoring needs. These missions developed in partnership with EUMETSAT include the Meteorological Operational satellite programme (MetOp) and the new generation of Geostationary Meteosat satellites (MSG & MTG satellites). These input data are used to reconstruct wind fields at various heights above ground. The model estimates also other physical quantities used in the produced power calculation (air temperature, air pressure, etc.). The calculus of the meteorological model are performed by the company GAP Ltd, spin-off belonging to the Polytechnic School of Bari. The activation of the Preciso® Wind service is very simple. The user must provide the coordinates of the sites chosen as potential location of a wind plant. After that, he can request a preliminary or producibility analysis. The preliminary analysis contains an estimation of the mean annual wind speed (m/s), at fixed heights from the ground. This analysis verifies also the presence of environmental restrictions in the area of interest, due for example to the presence of natural areas protected by the current laws. The producibility analysis offers the users also an estimate of the wind energy which can be theoretically produced in the site of interest. The wind data temporal series are converted in the produced energy using the power curves of one or more turbines, possibly supplied by the user. In this way, it is possible to evaluate the differences in performances between various turbine models and to analyze the obtained results at various heights, thus giving the user the possibility to choose the best investment. The results of the wind analysis are produced and delivered in few working days. 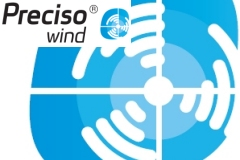 With the Preciso® wind service, developed in partnership with Ekolab Energia Ltd, it is now possible to give fast and accurate answers to every kind of subject interested in the wind power sector: investors, wind turbines producers, private sponsors, banks, legal and technical advisors, public administrations. Take a look at the wind data available for your choosen area (only Italy) and download the pdf report. Watch the video webinar (in Italian) "La reanalisi Eolica con Preciso Wind"
Fast: direct wind measurements not needed; wind and power reports are produced quickly with the availability of the multi-annual computational results previously obtained by the model. Cheap: it doesn’t depend on the availability of anemometers and it doesn’t require their purchase / installation. Accurate: the use of physical quantities like air density, other environmental parameters (ground roughness, orography) and several years of wind data reduces the uncertainties due to seasonal / annual wind variations. Calculus are executed using the real wind data distribution (which is characterized by a 10-min sampling frequency). Comparative analysis between different wind turbines. Preciso® italia: satellite orthoimages for the timely monitoring of changes on the territory. This is the base for of all products of the Preciso® family. Preciso® wind: Identification and characterization of optimal sites for eolic plants settlements. Preciso® zeta: 3D maps and study of land changes for infrastructures planning and management. Preciso® landslide: Landslides identification and monitoring for infrastructures planning and management. Preciso® on-line: Geoportal for e-Collaboration and dialogue between organizations and citizens in the planning process.